Immerse yourself in the elegant contemporary design of a Deluxe King Room. 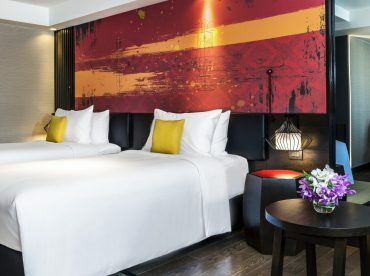 Brightly coloured silk wall hangings mirror the vibrancy of the city outside your window, while the luxurious king bed guarantees a good night’s sleep. In the morning, head to the hotel fitness centre for a revitalising workout. Upscale bath amenities add a fragrant touch to your post-gym shower experience, while complimentary WiFi and newspaper deliver directly to your room (upon request). Two rooms are designed for persons with reduced mobility.